Butler sophomore Quentin Hall returns after a solid freshman campaign and will likely be the Aviators’ top starter early in the season. 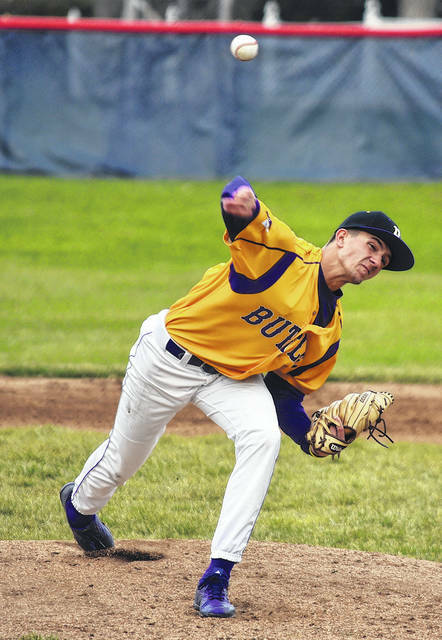 Butler senior and Wright State University commit Braedon Norman is recovering from Tommy John Surgery but hopes to contributed to the Butler Aviators this season. VANDALIA — Head Coach Trent Dues and his Aviators have set the gold standard at Butler over the last three decades, as his teams have finished no lower than second place in every season since 1995. It’s a rare feat that has been accomplished by players buying into a philosophy that requires hard work, versatility and team first attitude. Under the jerseys the words “Earn Everything” are blazoned across the backs of the Aviators. While it is especially fitting this season, it’s been a battle cry from the beginning. “We are coming into the season coming off a nice tournament run last year,” said Dues. In spite of losing a number of last season’s starters to graduation and injury, Dues is optimistic and eager for 2019. “We are looking to better last year’s second place finish in the GWOC North (11-4),” said Dues. Right out of the gate, there will be an unquestionable void on the mound for Butler. 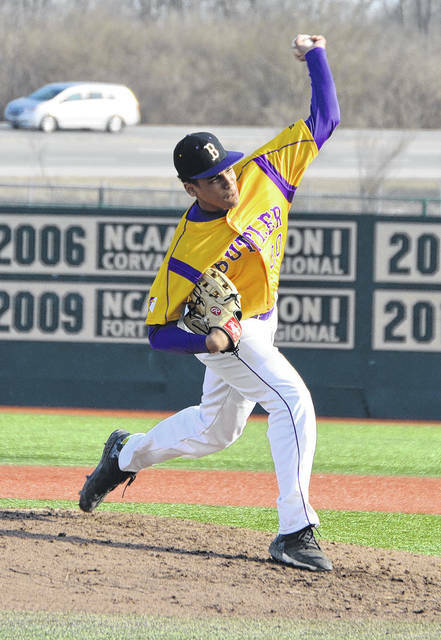 Three year starter and senior Wright State commit Braedon Norman (3-2, 47 k’s, 1.58 era, 31 ip), who is in the top five in several career pitching categories at Butler, is recovering from Tommy John surgery last May. “We will be looking to several guys who have the stuff to help us on the bump in seniors Cam Miller and Karter Peck, along with juniors Cooper Justice, Will Yeary and sophomore Kaiden Echeman,” said Dues. Diversability should serve the Aviators well, as Dues and staff should have a lot of flexibility with the lineups this season. “We are blessed with having four quality catchers,” said Dues. “Smith has all the tools, arm strength, athleticism, pop in his bat, running ability and game savvy,” said Dues. “I know they all want to catch but we have talked about this dilemma so that it does not create problems on our team,” said Dues. “We have a lot of guys who can do a lot. This creates some interesting dilemmas for the coaching staff but competition breeds success and that is our ultimate goal,” said Dues. “Miller and Peck played very well in the outfield last year and contributed offensively,” said Dues. “Our lineup will probably change depending upon who is on the hill and who is hot,” said Dues. “Many of our guys worked very hard in the off season and several are multiple sports guys,” said Dues.